Reducing poverty through the power of the bike. 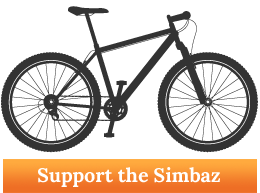 Bicycles for Humanity and the Safari Simbaz join forces with the purpose of reducing poverty through the power of the bike. The Bicycles for Humanity organization, well known as a leading donor of bicycles to Africa and the Safari Simbaz , who’s founder David Kinjah is well known for both his cycling achievements and developing cycling talent like Chris Froome ,have decided to join forces . Their shared mission is to use bicycles and cycling as development tools in Africa. Bicycles provide mobility giving people better access to education, healthcare, fresh water, and economic opportunity. In other words the aim is to reduce poverty through the power of the bike. Bicycles for Humanity ( B4H ) aims to collect and ship 40 000 bikes in the next three years to the Safari Simbaz where the containers used to transport the bikes will be turned into bike shops and local individuals will be trained to both fix and maintain bikes . These new skills will empower them to earn a living and become productive members of their communities and society as a whole. B4H is an extremely successful organization that since its inception in 2005 have shipped 155000 bikes to developing countries where hundreds have trained in how to manage bike initiatives for the betterment of all their communities. Founded by Pat Montani and Paul Shrewen, (better known as the English commentator for the Tour de France) B4H has created 50 chapters ( collection centres ) in 8 countries in the last 12 years. To date 200 bicycle empowerment centres have been created in 11 countries. Most amazing is the fact that the organization has no paid staff or overheads and functions on the efforts of volunteers.